Andy: So, Stew, listen. You know Infinity War is coming out this week, and we’re doing our Infinity War Extravaganza, with our Tuesday show being dedicated to it, and our bonus Friday review show after we watch the movie Thursday night. Andy: All right, so you have a blog scheduled for Thursday. That’s movie release day! Your blog has to be Avengers or Infinity War related. Also me, internally: I wish I had saved my Infinity War predictions until now. So here I sit, with my homework before me. Time to write a blog about “The Avengers”. I can do this! I mean, I’m GOING to do this, regardless of my ability level. I don’t actually have a topic in mind. I’m just going to roll with it. This is going to be some stream-of-consciousness Avengers writin’, is what I’m saying. So strap in, loyal reader, I guess we’re going to talk about The Avengers? See, the problem we encounter is that I am not The Avengers buff that Andy is. Andy loves The Avengers and Vision and Scarlet Witch and all the rest. He is a big fan of the team. I was more of an X-Men and Spider-Man fan. I bought some Avengers books, but I was never married to the team. My first ever Avengers comic was #326, and it didn’t even start a long-time stretch of buying the book. I just grabbed that one and then came back to the series a while later. That’s the first appearance of Rage! Rage, the eventual New Warrior who was apparently 15 years old, but was drawn like he was 35, completely with lush chest hair. I remember he bent a girder into a circle and spun it around his wrist while scolding Captain America on the team’s history of not having many black members except for a few tokens that were forced upon them. As I continuously hit “Next” on Marvel’s Wiki, it’s not until #343 that I see another cover I recognize. That’s where I started collecting regularly, because from that point on, I had purchased the next several issues (the Operation Galactic Storm storyline and onward from there). You’ll hear me joke a lot on our podcast about how MY Avengers are Black Knight, Sersi, Crystal, Hercules, Eric Masterson, and white Vision, and I’m patiently awaiting MCU Phase Eight because by then, the films should be starring these guys. This is why; that’s my Avengers era! All 1990’s and brown jackets full of pouches and clean-shaven Hercules and Eric friggin’ Masterson who I WON’T hear a bad word about! It seems like it was around issue #363 that I jumped back off the book and stayed more in my X-lane from there out (not to mention needing the money to buy all the Image titles I was collecting). And I would stay away from all things Avenging until Brian Michael Bendis formed The New Avengers with Cap, Iron Man, Spidey, Wolverine, Luke Cage, and Spider-Woman. 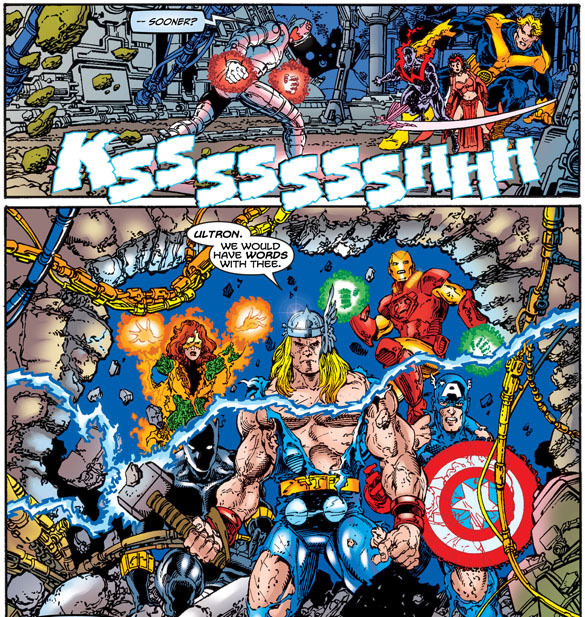 Which is a shame because it meant I missed Kurt Busiek’s run on The Avengers. I would go on to read those issues years later, and I think, for all their faults (alcoholic Carol Danvers, and… really, I think alcoholic Carol Danvers might have been their only fault), they might stand as my favorite Avengers books. I enjoy the nostalgia of that crap early 90’s team no one recognizes, and I dig the Bendis-iness of the New Avengers, but Busiek told some fascinating stories over George Perez’ standard-setting artwork. As far as I am concerned, Busiek and Perez birthed the DEFINITIVE Ultron and Kang stories for Marvel. Seriously, MCU? How you gonna do a movie about Ultron and not include “We would have words with thee”? Let’s hope Andy isn’t reading this, but I think I viewed The Avengers for most of my life the way he viewed DC. As big, overpowered, stuffed shirts that represented the wealthy and the powerful more than they represented anything I cared about. That’s why I didn’t grow up a fan and why I skipped quality material like the Busiek era. They were the plain white bread of the Marvel Universe, with Captain America–I HATED Captain America as a kid and thought he was the most boring character in all of Marvel–being a one-dimensional, flawless paragon, Iron Man having no personality to speak of, and Thor being the guy who talked funny and was too powerful to ever be threatened. It is an interesting correlation, because I know how Andy (in general terms) tends to find the base of the DC Universe to be dry, overpowered, and devoid of character; those were The Avengers for me growing up. The MCU has gone a long way with some legendary casting towards correcting that conception. And so here I sit, awaiting the third Avengers movie, the culmination of ten years of films, sure, but also the culmination of 28 years of Avengers material for me where my thoughts on Marvel’s Mightiest Heroes have grown and changed and become so much more essential than I would have imagined as a ten year old. This movie is going to be so darn good!